This 11 day vacation features your stay in some of the finest Irish Manors and castles that Ireland has to offer as well as an included ferry trip to Inismore, the largest of the Aran Islands and home to the spectacular pre-Christian Dun Aonghus Fort. While this tour includes many of Ireland’s most iconic locations, it will also afford you the opportunity to experience something extra. Due to the fact all of our travel consultants live in Ireland, they also have an intimate knowledge of Ireland’s hidden gems; sights and locations they will be more than happy to direct you to. We design all of our tours in-house with precision and a dedication to quality that is unmatched in the industry. To compliment your tour you will have your own dedicated travel consultant as well as the comprehensive daily sightseeing guide that will be provided for you. One of the highlights of yours stay here in Ireland will undoubtedly be the complimentary guided tour of the 15th century Castle ruins beside Ballinalacken House by its owner. A head for heights is most definitely a requirement for this experience as you gaze out from the battlement ruins at the top of the castle over the mesmerizing west coast of county Clare and the Burren region, a karst landscape almost lunar in appearance! Keep in mind that all elements of this vacation package can be customized to suit your needs. Car rental (manual) for 9 days - including our special comfort pack complete with GPS, additional driver and super cover for peace of mind driving. Upon arriving in Dublin Airport and after collecting your Hertz rental car it is time to take the short journey to Cashel in County Tipperary. Your first stop is The Irish National Stud and Japanese Gardens in Kildare Town. The National Stud comprises three separate attractions. The 1,000 acre Farm at Tully has been in use as a Stud Farm since 1900 when it was owned by Col. William Hall-Walker. It is home to some of Ireland's finest thoroughbreds. There's a Horse Museum tracing the history of the horse in Ireland using artifacts as well as the Japanese Gardens which are located on the grounds of the Stud Farm and were created between 1906 and 1910. The last leg of today’s journey brings you to the Rock of Cashel in the County of Tipperary and it has been in use since the fourth century. Because of its height and the fact that the surrounding land of Tipperary can be seen for miles, this made it an ideal fortress to defend against its enemies and was the perfect seat for the greatest of Ireland’s High Kings, Brian Boru. This site is also strongly associated with St. Patrick in the 5th century. In the evening time, stroll the streets of this quaint small town and interact with the friendly locals while you enjoy the local pubs. There are a number of day trips to be experienced from Cashel and all within easy reach. These include a trip to the small City of Kilkenny. Long renowned as Ireland’s Medieval Capital, the city’s origins date back more than 1,500 years. Characterized by beautifully restored old buildings, Kilkenny City is small and compact enough to explore on foot, yet full of fascinating, historical buildings. Kilkenny Castle is a 12th century castle remodelled in Victorian times and set in extensive parklands. Also in Kilkenny is Saint Canice's Cathedral, the second longest of Ireland's medieval cathedrals. Built on the site of an earlier church, the major portion of the work that produced the beautiful Gothic structure was carried out in the middle of the 13th Century. We highly recommend you visit the 300 year old Smithwick’s Brewery which stands on the site of the old St. Francis Abbey. You can then travel onwards to Waterford where you will see the Waterford Crystal factory. This morning time, you will be travelling from Cashel to the Kingdom of Kerry in Irelands spectacular South West. First stop is Cahir Castle, once an important stronghold of the powerful Butler family, which retains its impressive keep, tower and much of its original defensive structure. 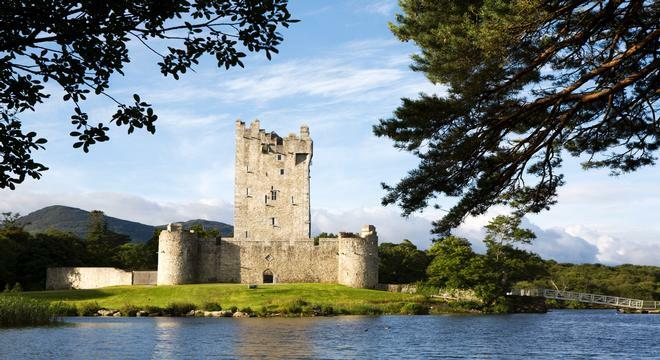 It is one of Ireland’s largest and best-preserved castles. For those who wish to have an early start and take a slightly longer route to Killarney, Blarney Castle and the ‘Gift of Eloquence’ awaits. Onwards to Killarney. With its three famous lakes and majestic mountain ranges, Killarney has been the inspiration of poets and painters over many centuries. The Killarney National Park is internationally renowned both for its scenic beauty and scientific interest. There are many walks and trails around Killarney including a 2-hour tourist trail around the town itself. You will also have a chance to visit Ross Castle, the Gap of Dunloe with the Black Valley. From here, travel north to Ballyseede Castle just outside the town of Tralee where you will be spending the next 2 nights. Today choose to simply relax in Ballyseede Castle and the nearby town of Tralee or take on a days touring of either the Ring of Kerry or Dingle Peninsula to the west. While the Dingle Peninsula is the shorter drive and is graced with more interesting antiquities, historic sites and varied mountain scenery than any other part of Ireland, the Ring of Kerry includes the stunning views over the lakes of Killarney from Moll’s Gap as well as numerous colourful villages on this route. Not for the faint-hearted, you will remember this mountain pass drive forever. The Dingle route includes visits to the lovely fishing town of Dingle and beyond to Dunbeag Promontory Fort, an archaeological site on the from the late Bronze Age, 800 BC. Continue on to Slea Head and here you will see Dun An Oir (Fort of Gold). Nearby is the Gallarus Oratory, one of the best preserved early Christian church buildings in Ireland. Back to Tralee town where you can relax in the luxurious surrounds of Ballyseede Castle. One of the most dramatic days of your tour brings you to the west coast of County Clare. First stop will be the Village of Adare in County Limerick. Adare is regarded by many a seasoned traveller as Ireland’s prettiest village with its charming thatched cottages, manicured public park and ancient church. From Adare village continue towards Limerick City of ‘Angela’s Ashes’ fame and home to King Johns Castle. Shortly after this, you arrive at Bunratty Castle. Built in 1425, this majestic castle was restored in 1954 to its former medieval splendour. Within the grounds of the Castle is Bunratty Folk Park where 19th century Irish life is vividly recreated. Continuing on to the magnificent ‘Cliffs of Moher’. The majestic Cliffs of Moher are without doubt one of Ireland’s most spectacular sights and overlook the Atlantic Ocean on the coast of West Clare. You then arrive at the village of Doolin. Doolin is world-famous for its wealth of Irish folk music and in recent years has been attracting crowds to spontaneous sessions in any one of its excellent pubs. Just north of the Cliffs you then have the lunar like Burren region and the ancient Poulnabrone Dolmen Tombs. Make sure to take the guided tour led by the hotels owner of the 15th century Castle ruins that sits next to Ballinalacken House and don’t forget to bring your camera. Drive the short distance to Doolin pier and take the ferry to the Inishmore, the largest of the Aran Islands. Aran will take you back to an Ireland of Celts and Early Christians. Take a pony and trap, or a guided tour from the pier up the island to the stone fort of Dun Aonghus. The fort is located on top of a 300 foot high sea cliff and is one of the finest prehistoric monuments in Western Europe. For whatever reason, should you prefer not to take the ferry to the islands, then perhaps take a stunning cliff walk high above the Atlantic with stunning views of the Burren and Aran Islands. Travel to the lunar like Burren Region and the ancient Poulnabrone Dolmen Tombs. Also on route, you will have a chance to visit Dunguaire which was built in 1520 by the O'Hynes clan on the picturesque shores of Galway Bay. This evening, travel the short distance to Doolin or Lisdoonvarna to enjoy the best of traditional Irish music in one of the many excellent pubs. Day 7 – To Ballynahinch Castle in Connemara, County Galway. Today we travel to the University City of Galway and on to the Connemara region west of Galway. You will also have the chance to stop in Galway city, the ‘City of the Tribes’ is also known as Ireland’s Cultural and festival capital. With its street entertainers and traditional pubs with great music, Galway and in particular, the Quays area of the city centre will enthrall you particularly in the evening time. Other sites in Galway include Ireland’s largest medieval parish church, the Collegiate Church of St Nicholas of Myra dating back to 1320. Christopher Columbus reputedly worshipped in this church in 1477. Also nearby are Galway Cathedral, the Spanish Arch and Eyre Square. Continue west of Galway to the hauntingly beautiful Connemara Region. Situated on the most western seaboard of Europe, this unspoilt region boasts breathtaking scenery. The characteristic features of Connemara include its rugged, unpolluted coastline, dramatic mountains, numerous lakes and rivers and woodlands and the renowned Connemara National Park. Visit Kylemore Abbey and the Lough Inagh Valley as well as the spectacular Sky Road near the town of Clifden. You can also visit the fishing village of Roundstone and see how a ‘Bodhran’ (traditional Irish Drum) is made. Day 8 – While in Ballynahinch Castle in Connemara, County Galway. You may wish to simply relax at the castle today and perhaps take in one of the lovely walks near the castle. Depending on the season, you can decide to take advantage of the services of the expert ghillies that the Castle can arrange for beginners to experts as this castle is a member of the ‘Great Fishing Houses of Ireland’. Todays journey brings you east to our capital city of Dublin. A slight detour will also allow you a visit to the megalithic tombs of Newgrange. One of the great wonders of the ancient world, Newgrange is older than Stonehenge, Mycenae or even the Pyramids of Egypt and is foremost among the passage-tombs of Europe. Also in this area are the Hill of Tara (seat of Ireland’s ancient High Kings) and Trim castle. Depending on whether you took any detours earlier, you may have time to shop or sightsee in Dublin City. Close to your hotel are many of the city’s most historic attractions including The Guinness Storehouse, Trinity College, Dublin Castle and the National History Museum. Using the Hop-on Hop-off Bus ticket we provide, you will be able to visit many of Dublin’s most renowned and historical locations. Amongst other sites, you will see the Guinness Storehouse, the National Museum of Art and the historic Kilmainham Gaol where all of the leaders of the 1916 Easter Rising were executed. For a more light hearted experience, maybe a visit to the Irish Leprechaun Museum would be worth taking in. In the evening, there are many great Irish plays on in Dublin if that is to your taste. Of course, the authentic Dublin pub is an experience in itself and Dublin pub or literary tours are also freely available. In the evening you will attend the Irish House Party. The Irish House Party is completely unique in Dublin. Unlike any other traditional Irish music night in the city, it is organised and hosted by All-Ireland Champion traditional Irish musicians and dancers in an intimate and homely setting. Regrettably, this morning it is time to leave for the airport unless of course you are one of the lucky ones who has planned post night stays in Dublin or Belfast City.